Why These 6 UK Business Directories? Many businesses believe that the best way of being found by UK consumers is to target directories with a '.co.uk' domain. While there is obviously truth to this, the 6 most valuable UK business directories are the biggest web platforms with the highest global reach. 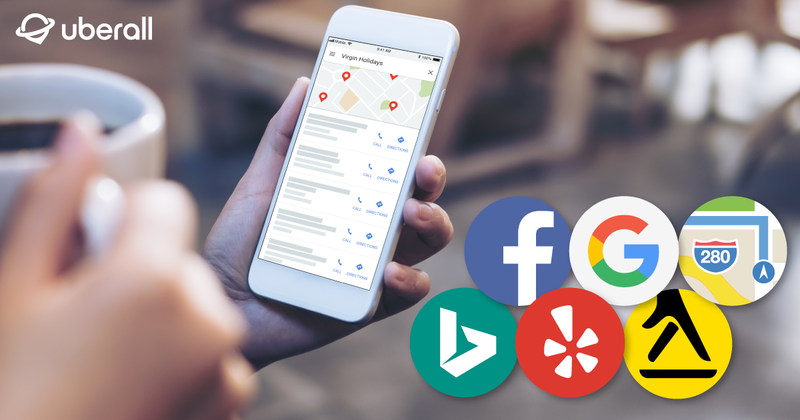 Platforms like Google, Facebook, Bing, Apple Maps, Yell and Yelp should be the first places you list your UK business since each platform has a high volume of monthly UK users searching for local goods, services and businesses themselves. If you want to rank for local search, getting a listing on these platforms should be your first priority. While including NAP (name, address, phone) information on business directories is an influential factor for local SEO, it’s important to remember that your optimisation efforts will be wasted if that information is not accurate and consistent across all directories. Being listed is powerful, but the accuracy of your business location listings is even more powerful. It should be no surprise that the businesses online with the most accurate and consistent data have a higher probability of ranking because they are providing users with truthful business information. This tops every list of important directories with 43 billion monthly visitors worldwide and 39 million unique monthly visits in the UK alone.1 Google is the number one website in the world and by far the most used search engine. To say “Google My Business is the first place you should list your business” is a no brainer. Why is Google such an important UK business directory? Like Google, Facebook offers businesses the opportunity to connect with consumers locally by offering them free business profiles. Facebook has 23 billion visitors (approximately 15 million unique UK visitors) every month,1 the strongest possible domain authority, the ability to create targeted ads and is one of the most important directories for customer management and promotion. Why is Facebook such an important UK business directory? >>Take a look at this comprehensive guide to Facebook to learn more about achieving maximum exposure for your locations. Yell is the UK’s leading online business directory, but is better known by its longer running physical directory - the Yellow Pages. With approximately 2.7 million business listings, 2.1 million unique UK visits every month and an almost exclusive UK presence,1 Yell is extremely important for UK consumers looking for products and services locally and important for businesses hoping to find customers who are ready to buy. Why is Yell is such an important UK business directory? With 9 million unique monthly visitors in the UK alone,1 Apple Maps is one of the most viewed sites in the UK. This is no surprise considering that the Apple iOS is the most used mobile operating system in the UK and Apple Maps is the default map app for approximately 1.3 billion active Apple devices worldwide.4 Businesses that register on Apple Maps Connect can include their company’s website URL as well as their Facebook, Twitter and Yelp profiles. Why is Apple Maps such an important UK business directory? Bing may not be as popular in the UK as in the US, but with 7.2 million unique visitors in the UK every month,1 it cannot be ignored. However, this is exactly what many UK businesses do thinking that because Google has such a dominant market share (around 89%),5 it isn’t important to register on Bing Places for Business. The fact that many businesses ignore Bing is what makes it an ideal opportunity for your business to potentially rank higher. Why is Bing such an important directory? Although Yelp is much more popular in the United States than in the UK (1.2 million unique UK views per month),1 Yelp has a high domain authority and is one of the most utilised business review sites in the world with over 100 million reviews.7 Yelp for Business Owners is free to sign up for and also has analytics tools which can help your business to see how many clicks, calls and page visits your Yelp pages are receiving. Why is Yelp such an important UK business directory? Getting your business locations listed on these six directories is a great first step towards establishing an effective online presence locally. The next step is to analyse the online footprint of your business and see if your listings pages are accurate and consistent. This online presence check tool will help you to identify the health of your business across the most important business directories so you can find and fix any inaccuracies in your current listings. The more accurate your online business listings are, the more likely your business is to be found by customers looking to buy locally right now.